BANGI, 25 June 2014 – Malaysia should address income disparity by imposing proportionately higher taxes on the top 20% of the country’s wealthiest. Economist Dr Choy Yee Keong of Kyoto University in Japan said despite Malaysia’s impressive development record, the country is the most unequal in terms of income distribution in the Association of South-East Asian Nations (ASEAN). He also disclosed that despite the New Economic Policy (NEP) the Bumiputera’s mean monthly income is the lowest among the three major ethnic groups. Giving his public lecture in conjunction with The National University of Malaysia’s (UKM) Institute of Environment and Development’s (LESTARI) 20th Anniversary here today, Dr Choy said tax incentives and exemptions mainly benefit the rich multinational or monopolistic corporations and cannot address income inequality. World Bank statistics showed Malaysia as having the highest GDP per capita among the top five ASEAN countries excluding Singapore but ironically it also has the biggest disparity in income with obvious unequal wealth distribution. Also present at the lecture were Vice-Chancellor Professor Dato’ Dr Noor Azlan Ghazali, Director of Lestari Prof Dr Mohd Raihan Taha, Senior Fellow Dato’ Shaharuddin Mohamad Ismail and the event’s chairman Emeritus Prof Chamhuri Siwar. Dr Choy said the top 20% of Malaysia’s population hold more than 51% of the country’s wealth, with the top 10% owning more than 35%. The bottom 20% has less than 5% of the country’s wealth. Dr Choy, who undertook his study between 2007 and 2012, however, said that there is no one-size-fits-all solution to the problem of income inequality. He proposed Malaysia seek methods that take into account its multi-ethnic dynamics and the wide gap in income between the urban and rural populations. Malaysia is considered an upper middle-income nation by the Organisation of Economic Cooperation and Development (OECD) because it managed to reduce poverty from almost 50% of the population in 1970 to 1.7% in 2012. He also said that urban poverty is becoming an increasingly critical issue because incidence of urban poverty increased from 1.7% in 2009 to 3.4% in 2012. He suggested efforts be made to focus on reducing inequality between the urban rich and the urban poor. One method is by designing policies or programmes of transfers and redistribution from the rich especially the top 10% super rich capitalists to the 40% lowest poor particularly the marginal wage earners. The top 20% rich should be made to pay proportionately more taxes. The government should improve funding for pro-poor projects. The Orang Asli and the other indigenous ethnic groups of Malaysia are the most vulnerable when it comes to poverty, especially those who still live in the rural areas and the ancestral lands such as forests. When asked whether the Goods and Services Tax (GST) to be introduced in 2015 could help alleviate the wide income gap, his expressed concern that it might exacerbate the situation. “GST is an across-the-board regressive tax that can impact the poor. They spend much of their earnings on essential items. Unless there are exemptions for certain essential goods, it would not be helpful for them,” he explained. Prof Chamhuri, who introduced Dr Choy remarked that the GST was still a contentious issue and the government should provide a schedule of items that are not subject to the new consumption tax. On economic growth, Dr Choy said although increasing government revenue is important in poverty eradication, it may not bring the necessary trickledown effect to all sectors of society. Unrealistic poverty benchmarks should be reviewed to reflect the socio-economic woes suffered by the urban or rural poor by taking into consideration differences in cost of living in urban and rural areas and the increasing cost of living. 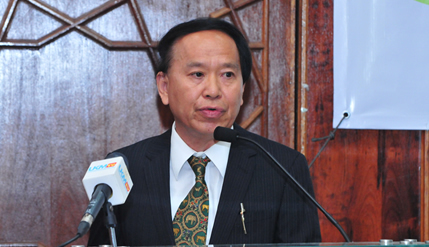 Dr Choy was born and bred in Ipoh. He received his Masters of Economics from Chuo University, Tokyo and PhD in Economics from Keio University in Tokyo, majoring in sustainable development and environment studies. He is currently teaching economics and ethnic issues in sustainable development at the Graduate School of Economics, Kyoto University, Japan with special focus on development issues in the ASEAN region. These include urban slums and rural poverty and the ethics of sustainability among others.